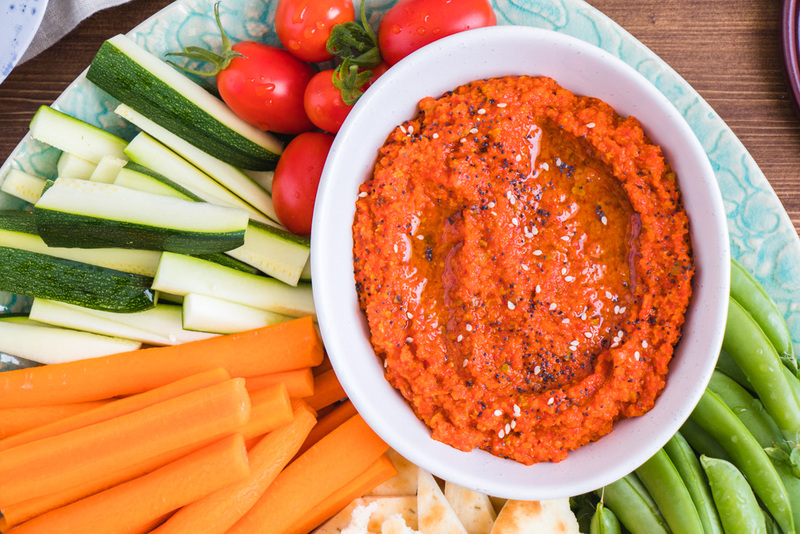 This Roasted Red Pepper Dip is our variation on the traditional Middle Eastern dip, Muhammara. Our version nicks the walnuts for edamame, so Katherine (who has a tree nut allergy) can eat it. This also allows you to send your child to school with a healthy snack, since most schools have a ban on nuts due to allergies. 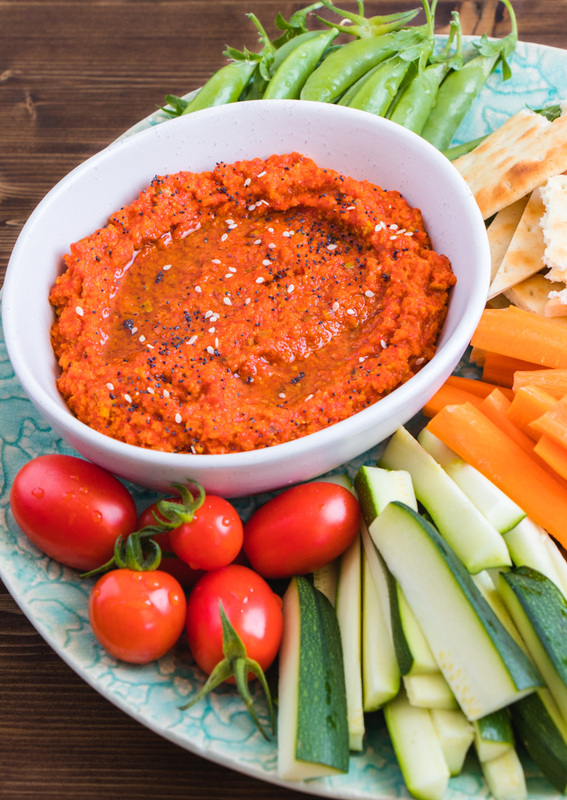 So time to break out the food processor and whip up this easy and tasty dip! Let’s talk about what makes this so special. 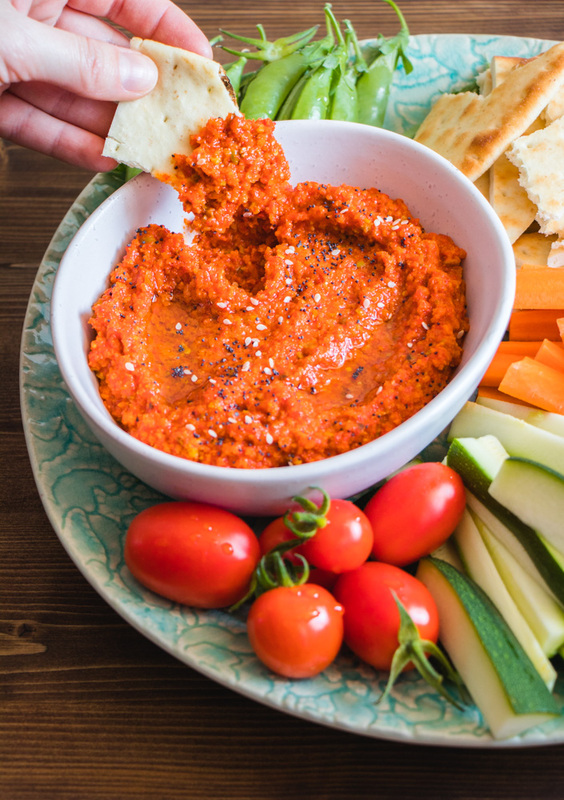 For starters, the roasted red peppers add a light smokiness to the dip, without being over powering. We used honey in place of the traditional pomegranate molasses, mainly because it’s much easier to find/purchase. The sweetness of the honey and the addition of bread crumbs helps to cut the acidity from the peppers. And don’t get weirded out by the bread crumbs, they are 100% necessary. That being said, use gluten free ones if you need to, or whole wheat bread crumbs. 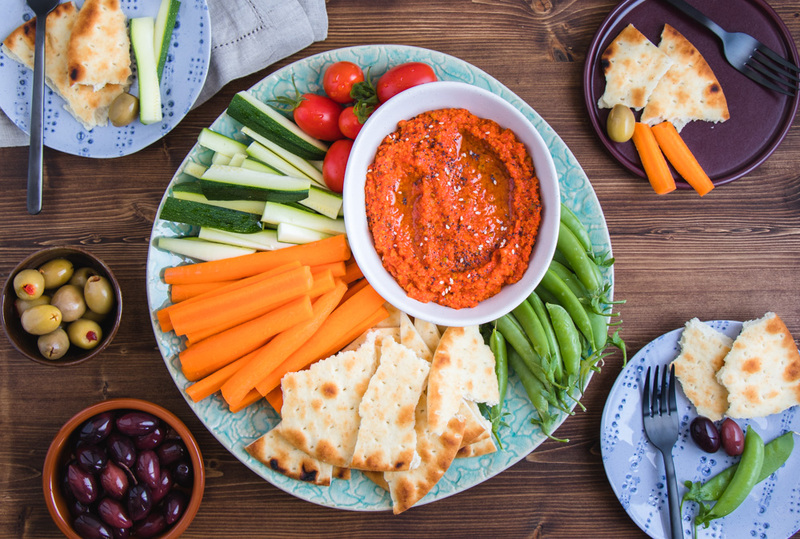 And I know we already mentioned the edamame, but guys, this also adds protein to the dip to help fill you up! The olive oil, a healthy fat that is full of antioxidants, also gives it satiety. Since we were using a bean instead of a nut, we roasted them to bring out a nutty flavour. And because roasted garlic makes everything better, we roasted that as well. Delicious. 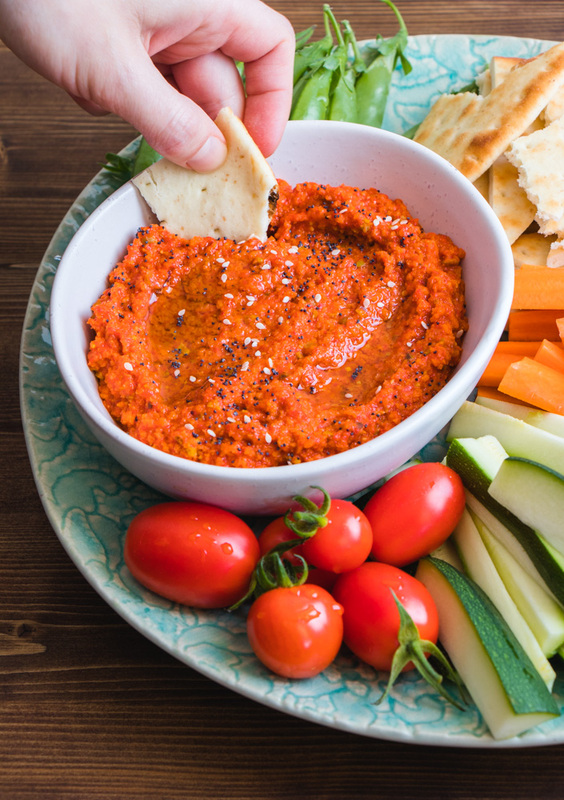 Basically this dip could be a well rounded meal if you wanted it to be. No one is judging over here, it’s been done many a time. And, I don’t know about you guys, but after summer, I need to get back on track, and this is perfect for a work snack. It’s healthy, delicious, and easy! Serve with some chopped up veggies and pita bread and you’re good to go. Enjoy! 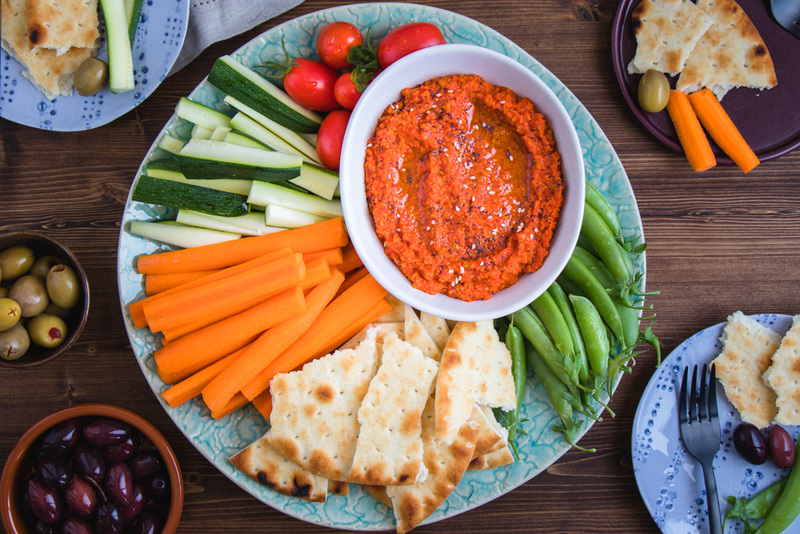 A sweet and savoury dip that's perfect to share with company or to take to work for a healthy snack! Preheat the oven to 375F. Line a baking sheet with parchment paper and add your edamame, cloves garlic and 1 tbsp olive oil. Toss to combine. Bake for 15-20 minutes, stirring halfway through, until edamame are beginning to brown. Remove and allow to cool. Add all remaining ingredients to a food processor. Squeeze the galic cloves from their skins and add to the processor, along with the roasted edamame. Process until smooth. Serve with fresh chopped vegetables and pita bread. Store in the fridge for up to a week.